Eagle's Nest (Cottages On Serenity Lake)- custom home on small, private lake! Enter the driveway of the tall majestic pines that paint the surrounding area around your entrance to open up to a beautiful private lake nestled among mother nature and drive to your chosen cabin/cottage to enjoy the soft whisper of her breath as the breeze whistles through the trees and over the lake. From inside, enjoy the smell of a fresh, sparkling fire, the flames dancing off the walls as if listening to a favorite song. And enjoy the many pine and custom accents that make you realize you are in the wilderness among mother nature's finest treasures! Enjoy the view through the many custom windows that will make you feel like you are outdoors with the warmth and coziness of still being inside! From outside, enjoy catching fish that most people only read about, that will leave memories in your children's hearts, as well as your own, not to mention, the deer you see... the porcupines, cardinals, blue jays, raccoons, hawks, owls, fox, beaver, otters, bald eagles or any other numerous wildlife that those who are dedicated to find will! ***Calendar is displayed but please contact owner for current availability!! ***Also, rates that are listed are beginning rates during the 'Off-season'. Please contact owner for questions. Eagle's Nest is a small 4-bedroom/2-bath home with a loft. The upper 2 bedrooms are open hence the loft. Eagle's Nest is the most private of the 4 homes that are on a small, private lake and the closest home has its' own private entrance and the front gate stays locked at all times with only our guests and your guests having the access information making them even more private! Eagle's Nest has its' own wood-burning fire place, out door hot tub (facing Serenity Lake, your own fire pit and beach so you can swim and fish right from your cottage!! We have kayak, canoe, paddle board, floating oasis and rowboat rentals available or you are welcome to bring your own. Pets are $40 for the first pet, for 2 nights and $10 per night after that. Each additional pet is $20 for the first two nights and $10 per night after that. Pets are $75 for the first pet for a full week and $50 for each additional pet. On-season (May 15th-September 14th) is a minimum of 6 guests. Also, major holidays are a 4-night minimum; minor holidays are a 3-night minimum and the opening rifle deer hunt is a 5-night minimum. We do not rent Saturday to Saturday or Sunday to Sunday (and do cannot begin a rental on a Saturday or Sunday) Any other night of the week is fine. Certain dates are a 3-night minimum when there are 3 nights available between other families or groups staying. Please inquire if you have any questions! Thank you! Private lake and a custom home sits on approx. 80 acres so there is plenty of parking! Each home is a football field (couple acres away from any other home making it very private. Canoe, kayak, rowboat and "floating oasis" rentals available (and exclusively for our clients and more affordable than you will find anywhere else!) You are also welcome to bring your own. Eagle's Nest has a deck facing Serenity Lake. Eagle's Nest has its' own outdoor hot tub facing the lake. Your cottage/cabin is on its own private lake and has a fireplace, your own outdoor hot tub, fire pit and its own beach area! There is a volleyball court and horse shoe pits on site and there are trails going throughout the over 80 acres of mother nature for walking, hiking, bicycling, cross-country skiing, snow-shoeing, snowmobiling, hunting, or simply enjoying with your children or group. At Serenity Lake, you can swim, canoe, kayak, use floaties,,or just enjoy some of the best fishing you have ever had with large-mouth bass, blue gill, crappie, perch, northern pike and walleye!! (And no fishing license required/largest bass this year was 21 inches/largest crappie-16 inches!!) We also have canoe, kayak, paddle-board, "floating oasis" and row boat rentals available or you are welcome to bring your own. Only clients and family are allowed on the property--no general public!! Enjoy the utmost privacy and tranquility while visiting! The lake is aptly named! We enjoyed the peacefulness and the views of the lake. The weather kept us inside. There were 8 of us. Although there was plenty of table space outside, I don't think that dining inside would be comfortable for more than 8. We had a great time. I stayed at this cabin for a girls weekend! It was absolutely perfect! It was clean, and such a cute, cozy little cabin! Make sure you read the owners instructions, otherwise you may get a bit lost! The owner was super easy to communicate with and was very accommodating! I definitely recommend this place and we are looking forward to another reunion here in the future! My husband, dog and I stayed for a 3-day weekend with another couple and their dog. We really enjoyed the cabin and the host, Brian was a super nice, helpful guy. It was peaceful and quiet and we saw turkeys and deer each night. The cottage was cozy and the fireplace was lovely. We took long walks on the trails. We especially enjoyed the outdoor hot tub. A few things to know before the trip- there are plenty of plates, silverware, and glassware. There is also a crockpot, a hand mixer, and a few pots and and pans. You will need to bring anything else you may need (condiments, seasonings, matches, food processor [if you use yours as much as I use mine :)], basically anything other than salt and pepper). I only mention this because some places have these things and some don't. Brian brought us over some charcoal and lighter fluid which was really nice of him and Black River Falls isn't very far away if you do forget something. If you are someone who needs Wi-Fi for doing work or something, there isn't Wi-Fi and cell reception is spotty if you don't have Verizon. We appreciated being "unplugged" for the weekend. Dogs are not allowed in the loft so if you bring a furry friend that won't leave your side, you'll need to use one the bedrooms downstairs. We used the one overlooking the lake. Our quiet, cozy, fun Christmas get-away, 2016! First let me say that the customer service from the owners at Serenity Lake Cottages was top-notch right from the start! From their flexibility with a delay in our ability to lock in our dates, to the plethora of helpful information about the opportunities for family-fun, the care was exceptional – even before our arrival. Then we arrived to find a lovely, cozy, secluded cabin surrounded by woods, water & wildlife – for an escape from the usual holiday chaos that was – well – nothing less than serene! We really enjoyed having some amenities to further our relaxation – such as hot showers, and full kitchen (including a dishwasher.) But our favorite bonus ‘comforts’ were the wood burning fireplace by which to warm up following an outdoor dip in that luxurious hot tub! Mother nature stepped in and provided us with 2 evenings to do some rare, winter-time star-gazing from the tub. Our bathing suits got a workout, as we enjoyed the tub all but one night (only because we were graced with another rarity – a December thunderstorm!) The fishing was excellent! We found a few bigger crappies, but had consistent catches for 2 of the 3 days that we were able to fish. This was exciting for our young daughters who got to experience this for the first time this year! It was the perfect way to introduce them to this particular activity. The entire property was gorgeous, and we took a few hikes on the plowed trail around the lake – one at night by moonlight. Breath-taking. With so much to do – or NOT to do (as in RELAX via hot tub and fireside) – it was the perfect Christmas get-away for our family of 4. Lots of priceless memories made. From our family to yours - thank you Brian & family! We've stayed at Eagles Nest twice now and each time was perfect. From peaceful walks on the trails to relaxing in the hot tub....we were never disappointed. We can't wait to return to the cozy, secluded cabin surrounded by beautiful scenery. We made a lot of great family memories! Thank you! I stayed at the Cottages on Serenity Lake for a family reunion during Labor Day weekend. We rented the Bear’s Den and Eagle’s Nest cabins to accommodate our group of 24 people. The Bear’s Den cottage had a nice-sized kitchen and living space as well as a large bathroom. The Eagle’s Nest cabin, although able to sleep more people, had a smaller kitchen/living area that was a little cramped for the amount of people staying there. The porch areas (Bear’s Den has a covered porch) with patio furniture and picnic tables were nice and used often. The hot tubs at each cottage were also a plus. Having access to the private lake was great in that we felt very secluded and could enjoy the beautiful views and relative quiet. Our group did a bit of kayaking (we brought our own), row boating, and fishing. However, we did not want to do much swimming as the water is quite brown and a bit slimy. We were told it was the tannins from the pine trees, but it made swimming unappetizing for our group. There are grills available as listed – make sure to bring charcoal. I’m not sure if the owner, Brian, was a little nervous about having such a large group, but he came around to chat each day and sent many messages to our aunt who arranged the reunion along with reminders of fees, etc. throughout our stay. I’ve used VRBO many times and have never experienced this. Also, the security deposit was very large and we were anxious about making sure everything was totally clean in order to get it all back. Our group made use of the sand volleyball court and trails on the property. The fire pits at each cottage were a nice size, so make sure to bring camp chairs so you can take advantage of the beautiful star gazing that’s available. Make sure not to forget your bug spray! Thank you for taking the time to provide a response and sharing your weekend. We are glad that you found the homes sufficient enough for your size family and we are glad you were able to enjoy all the amenities that you were. We are sorry that you found the color of the water not pleasant as this is typical throughout the Jackson County. A couple blessings are that we do not get the excessive weed-growth and it makes it very soothing for lying in floaties. Another benefit of being spring-fed is it is VERY clean. Serenity Lake, in it's history, has had two different types of trout and two things required for trout is cold water and clean water. During the latter part of July, August and into September, many even popular lakes develop an algae bloom that overtakes many lakes making them completely un-swimmable. Another benefit that we have on our lake is we do not get ANY algae blooms . We have placards on each of the refrigerators that explain this to our guests and I believe one of your guests asked me about it when I stopped by, and it was explained to her. The sec. deposit is set depending on the # of guests, the home (s), boat rentals and pets. and is just insurance that there are no damages. Regarding stopping by, we send someone by once a day to check to see if our guests need anything. The host of this party was very challenging and the text messages were primarily in response to her requests. I understand that you thought it was I sending her many requests. With the exception of one of the guests leaving the gate open, the texts were in RESPONSE to your aunt's requests.You mentioned that we were possibly nervous about having such a large group of 24 guests. However, we are used to several groups of 100+. I was a little concerned about your group but it was because of the repeated requests from your aunt for a various of reasons. In 12 years of managing this property, it was one of the most challenging. We ended up explaining several things repeatedly and think this added to her frustration in managing the trip. At the end, we suggested that she find a different location for future visits as this just did not seem like a good fit for her. As far as the rest of the family, everyone was very pleasant and there were no issues. We enjoyed having them and everyone was appreciative and very cordial. We thank you for taking the time to share your experience and thank you for taking great care of your homes and our property. 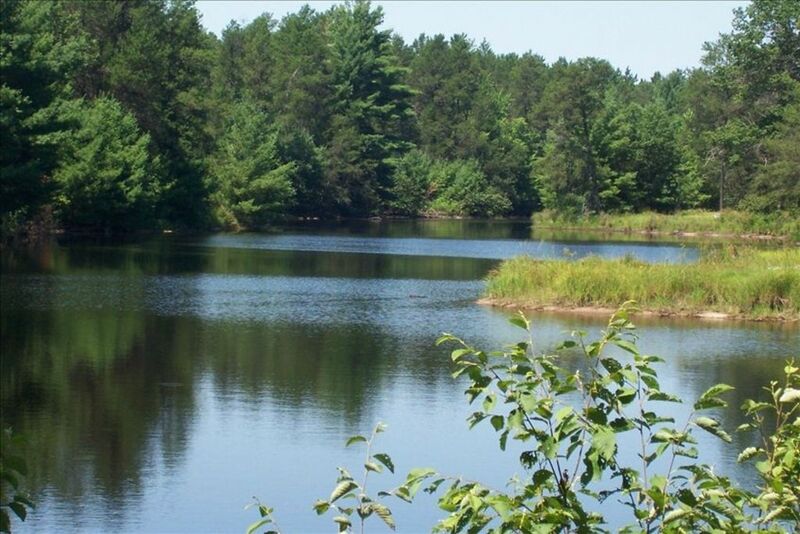 We are less than 5 minutes from Lake Arbutus, Black River access, the ATV trails and county and state land. We are 10 minutes or less from anything else you might be looking to do in the area!